As is so often the case one man’s misfortune is another man’s blessing, and Cuthbert Ottaway’s entry in the record books is partly owed to an injury that kept the legendary ‘Father of Modern Sport’ Charles Alcock from playing in the first ever international football match against Scotland on 30th November 1872. Like Alcock, he was a consummate cricketer and also proficient in real tennis, rackets and athletics, but unfortunately his untimely death from tuberculosis at the age of 27 cut his list of achievements short. 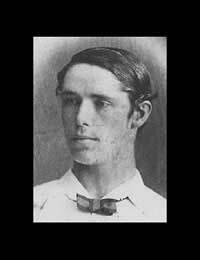 Cuthbert Ottaway was born in Dover in 1850 and took what was then one of the traditional routes to sport, through attending Eton and then Oxford University. This was at a time when Association Football was beginning to settle in terms of consistent rules and growing in popularity as a result. He was very quick, an excellent dribbler and featured in three successive FA Cup Finals, albeit for different teams, as it wasn’t unusual to play for a number of clubs at the same time in those days. Ottaway was renowned as a skilful player in a day when kicking the player was more accepted. In fact, it was the Football Association’s decision to outlaw ‘hacking’, the deliberate kicking of an opponent, rather than the disagreement over handling the ball, which lead to Rugby School’s resignation from the FA and the subsequent foundation of the Rugby Football Union. At the same time, the international scene was beginning to unfold, and after a couple of matches between England and Scotland on an unofficial basis, the first officially recognised international match took place on 30th November 1872. This was again between England and Scotland, for the simple reason that there weren’t any other national teams in existence. The instigator of these matches (and the FA Cup as well) was Charles Alcock, then Secretary of the FA and team selector. Alcock had selected himself as the captain but was then injured in a league game and chose Ottoway to replace him. The match was a no-score draw with reports at the time describing it a full-on English attack competently repelled by a well organised Scottish defence. That the Scottish team were well organised was not really a surprise, considering all the players came from the same club as the team selector, Queen’s Park. Ottaway didn’t play in the return match at the Kennington Oval in 1873, which England won 4-2, but he did play in the third match against Scotland, on 7th March 1874, and again captained the side. Scotland won that match 2-1 to level the series at that point. In cricket he attained the highest honour available (as Test Matches hadn’t yet begun) which was to represent the Gentlemen against the Players. He also played for Oxford in four Varsity matches against Cambridge. His early death is sometimes attributed to a ‘chill caught while out dancing’ but tuberculosis is considered more likely, but either way both cricket and football lost a superb player before his time.